Mid-Cheshire Camera Club was pleased to welcome David Bibby of North Fylde Photographic Society last Wednesday evening. Having battled his way down the wet and windy motorway he wasted no time in taking us through a potted history of his 30 years in club photography. His style was honest and light-hearted and as one member put it “I felt he was on our side of the counter”. Despite being a judge himself he admitted that he finds judges’ comments can be frustrating and disappointing but he never lets this get in the way of producing images that he likes. This was no flagship display of “my best work” but more of a journey loosely using the alphabet to route us through some of the key elements that make a good photograph. He emphasised in particular the importance of paying attention to detail and never blinded us with technical jargon. From the many positive responses that I have received from the audience we will definitely be inviting him back. 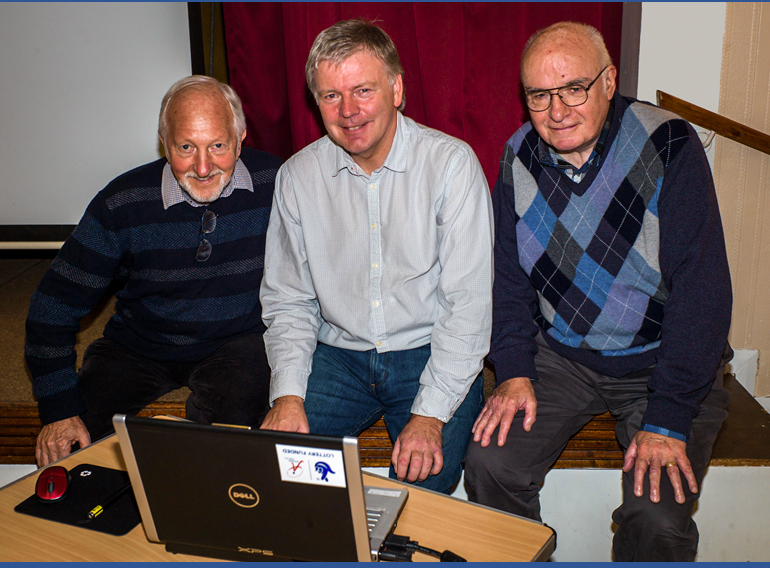 This photograph was taken by our Press Officer Ken Hewitt and shows David Bibby in the centre with Chairman Ray Hill on the left and member David Jones on the right.